Since 2003, the Miskatonic University Library Association series of monographs has been Chaosium, Inc.’s way of making other works available to players of both Call of Cthulhu and Basic RolePlay. Bar the printing, each monograph’s author is responsible for the writing, the editing, and the layout, so far the quality of entries in the series have varied widely and has led to some dreadful releases. Fortunately, Return of the Ripper: An 1890s Scenario for Call of Cthulhu and Cthulhu By Gaslight is far from dreadful in terms of both editing and layout, and potentially far from dreadful in terms of storytelling and writing. Supplements for Cthulhu by Gaslight are rare, either as titles available via standard distribution channels or as Monographs, but the truth is that in coming to Return of the Ripper, I bring a personal prejudice. The truth is that I dislike bringing Sherlock Holmes into my Victorian era roleplaying and I dislike bringing in Jack the Ripper into my Victorian era roleplaying, and I particularly dislike bringing in either into my Lovecraftian investigative horror roleplaying set in the Victorian era. I have no issue against Sherlock Holmes, enjoying both the fiction and the adaptations, particularly the radio versions starring Clive Merrison, Michael Williams, and Andrew Sachs, but Holmes is such a towering force of intellect and deduction that for him not to have deduced the existence of the Mythos, let alone determine the identity of the Ripper, seems absurd. Holmes is also so singular a figure and so synonymous with the period that the players are likely to obsess over him, their wanting to gain an audience with him and potentially his insight in-game. Further, he is a fictional character, and there are invariably enough fictional elements in my Lovecraftian investigative horror roleplaying and those elements are Lovecraft’s. Lastly, he is too easy a device to use to denote that it is the late Victorian era such that his use as a device is lazy writing. Basically though, his inclusion in Victorian era roleplaying is anything other than obligatory. As to Jack the Ripper, his use suffers from many of the same problems as Sherlock Holmes, but the tendency of roleplaying writing is to present the Ripper killings as a mystery to be solved. This runs counter to the nature of the crimes and their inexplicable nature – there is no explanation to them 125 years after they occurred and their perpetrator likewise remains unknown. 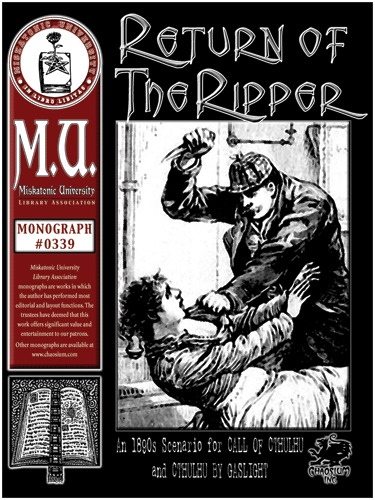 In presenting the Ripper killings as a mystery to be solved, the answer in Lovecraftian investigative horror roleplaying is always somehow related to the Cthulhu Mythos. It is rarely done well and it invariably detracts from the horror of the killings themselves. Fundamentally though, the use of either Sherlock Holmes or Jack the Ripper in Victorian era roleplaying is a cliché. The use of both is just plain boring. And so to Return of the Ripper, which as the title suggests, is about Jack the Ripper and being written for use with Call of Cthulhu, does involve Lovecraftian investigative horror roleplaying. With those black marks already against it, the monograph brings with it an awful lot of baggage of its very own. The author of the Return of the Ripper is William Barton and he also happened to write Cthulhu by Gaslight. As the author of the latter, Barton originally intended to include Return of the Ripper in the original 1986 Cthulhu by Gaslight boxed set as a counterpart to the scenario, ‘The Yorkshire Horrors’, but it was deemed too long and unsuitable as it provided a ‘supernatural’ or Mythos explanation to the Ripper killings. Of course, as the author points out, Chaosium would go on to publish a scenario that gave a Mythos explanation to the predations of the Ripper – ‘Signs Writ in Scarlet’ from the 1993 anthology, Sacraments of Evil. Slip forward fifteen years and Chaosium’s Monograph programme enabled the author to bring what would have otherwise have been a lost scenario to print. Return of the Ripper is set in the London of 1893. As it opens, there has been a brutal slaying of a prostitute in Whitechapel. This is only five years after the body of Mary Jane Kelly, the last of the victims of the most infamous murderer in history, Jack the Ripper, was discovered. Never caught, has ‘Saucy Jack’ returned to enact his bloody killings once again? Designed for a group of between four and eight investigators, one of whom should have some experience with the Mythos and possibly know the spell, Elder Sign, it is also suggested that such a group consist primarily of inquiry agents and journalists. Indeed, a group of merchants will directly approach a player character inquiry agent to gain his aid in ridding the East End of London of this foul threat. Alternative hooks are given for journalists, scholarly experts, and so on. Once they decide to probe the killings, the investigators must negotiate with the police; question the inhabitants of the notorious slums; search for information ahead of rival sleuths, and more… The Ripper though, is not the only outré threat that stalks the fogbound, ill lit streets of the heart of empire. Determining the nature of both these threats and the identity of the Ripper will be difficult and not just because the investigation process is difficult, but also because presenting the Return of the Ripper is equally as difficult. It is telling that the author of the Return of the Ripper states up front that the scenario “…is less linear than many CoC scenarios.” for the Return of the Ripper is anything other than linear in structure. Which is odd given the linearity of the author’s most well-known scenario, ‘The Curse of Chaugnar Faugn’ from Curse of the Chthonians: Four Odysseys Into Deadly Intrigue, but what the Return of the Ripper actually is, is a toolkit to create an investigation into a second series of Ripper killings. Along with hooks to get the investigators involved, the Monograph includes details of their enemies and allies, places of interest, clues and rumours, extensive encounters, and more. Indeed, there is everything here and more from which the Keeper can draw to help him craft a solid scenario, except that is, any sense of narrative structure, and worse, the ‘more’ of Return of the Ripper is a serious impediment to the Keeper in constructing that narrative. The ‘more’ of Return of the Ripper is that it is ferociously overwritten and it suffers from the repetition of detail after detail, especially with regard to villains of the piece. It is easy to see how the original manuscript ballooned from sixty to over three hundred pages, because simply it is all here. Every possible encounter, every little detail, all are covered, and whilst this admirable, it makes the Monograph hard to read, let alone digest and begin to put together as an adventure. Putting aside the scenario’s use of the Ripper Mythos, Return of the Ripper also makes extensive use of the Holmes Mythos, the Cthulhu Mythos, and to a much lesser extent, the Dracula Mythos. Of these, the use of the Ripper Mythos and the Cthulhu Mythos are to be expected, but the use of the Holmes Mythos is jarring, with various characters turning up and references being made, one of which is made into Ripper’s minion. As for the man himself, Return of the Ripper is set in 1893, so as far as anyone knows, he died at the Reichenbach Falls the previous year, so at least he cannot appear to break the scenario. Brought all together and the Mythos mix feels as if the author is over-egging the pudding. As does naming one of the villains of the piece, Macabre, which as surname is about as subtle being hit over the head with a sign that reads, “My name is Lord Villainy Villainous McVillain, High-Chief Villain of the Clan McVillain and you can tell that I am a villain by the way I twirl my facial hair.” How are the players expected to take such a name seriously? In addition, the author makes use of a number of skills that are not part of the Call of Cthulhu, Sixth Edition or earlier edition rules. They are at least explained in an appendix, rather than the Keeper being expected to refer to either The Gaslight Companion or A Cthulhian Miscellany. The first of these Monographs is yet to see print, although the second one, also by the author of Return of the Ripper, is in print. None of the use of the skills listed in the appendix is obligatory, and indeed, it could be argued that some of them are redundant. For example, ‘Observation’ is more Sherlock Holmes than Call of Cthulhu and does little more than Spot Hidden does; ‘Deduction’ is equally more Sherlock Holmes than Call of Cthulhu and does little more than an Idea roll does; and ‘Seduction’ is just a variation upon the Persuade skill. Physically, Return of the Ripper is reasonably produced for a Monograph. Some art is used to break up what is mostly dense text, but it is not always as clear as it could be. Similarly, the maps are not always as clear, and there could have been more maps of the scenario’s various locations. Return of the Ripper certainly makes demands of the Keeper to run and present, hampered as it is by the absence of a narrative structure upon which he could hang the elements given in the Monograph. Further, it demands that he and his players accept the idea that there is a Mythos explanation behind the Ripper killings and that Sherlock Holmes actually exists, which for some may be too big a pair of hurdles to overcome. If they can, then there is material enough to support an investigation into the Mythos activities of the Ripper, but it will be hard work.